You are here: COG Webcast > Sermons and Media > Videos > Real Authority: Why Passover not Easter? The Vatican is presently courting the Pentecostal churches to rejoin the “fold” of the Catholic church. Is this ecumenical model something the Church of God should embrace? As a group or individuals should we relinquish our biblical understanding of Passover, in favour of Easter? Or, do we have strong historic and biblical precedents that tell a cautionary tale, and warn us to avoid those who forsake the scriptural understanding and embrace concepts steeped in church tradition. What were those truths for which the apostle John and his followers were willing to sacrifice their lives? Who has the real authority to determine how and when we worship God? 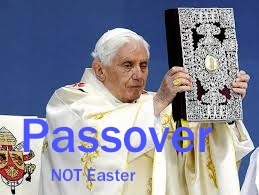 Why Passover not Easter! Being Holy True Worship: Will God hear your prayers?